Native to Northern Africa & available to hunt year-round, the Aoudad is a Barbary sheep, with hair fringes best developed in males on their forelegs and lower neck. 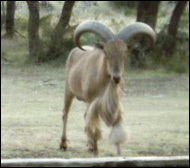 The Aoudad has high shoulders and a sloping back. Both males and females are sandy-colored with curving horns that never complete a full circle. Male horns usually grow 14-26 inches; however, they've been measured as large as 32-36 inches. Female horns generally grow 12-20 inches. Males typically weigh 200 pounds, and females are usually 140 pounds. They are native to dry, rock outcrops, and mountains. Most of their moisture comes from plants. These animals are competitive and gregarious in nature, and breed from late August to early December, with a gestation of 5 months.